After three seasons of visiting retailers in NC and FL to measure Christmas tree moisture content, NC State faculty can point to Christmas tree care practices that keep trees fresh and to major factors that dry trees out. 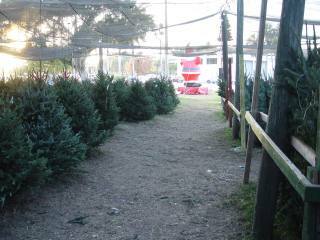 The majority of Fraser fir Christmas trees on retail lots were fresh, with supple foliage and adequate moisture content. Other Christmas tree species measured in quantity included Balsam and Douglas fir, neither of which held up as well as Fraser fir. Eighty one percent of the Fraser fir exhibited little or no needle shed compared to only 22% of the Balsam fir. Where 2 % of Fraser firs exhibited heavy needle loss, 14 % of Douglas fir and 65 % of the Balsam fir were shedding heavily. No segment of the retail market – chain store, garden center, grocery store, choose & cut farm, or independent retail lot – was free of problem trees. Every vendor type included operations where tree care practices failed to keep trees fresh. At some operations, just a few older trees exhibited freshness problems. At other retail sites, customers had to pick through sun-scalded trees or trees with easily shedding needles to find one that was holding up. 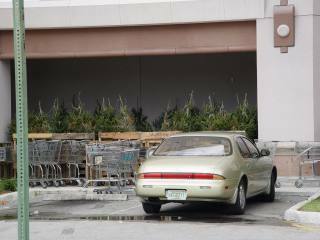 The best care by retail segment occurred at independent lots operated by Christmas tree growers. Setting up multiple deliveries for your inventory made a big difference in the moisture content of Christmas trees on display. Two deliveries were better than one, and three or four deliveries were better than two. It makes sense — multiple deliveries allow growers to cut later those trees that will be sold later. Storage conditions are generally cooler at mountain farms than on your retail yard. Multiple deliveries provide trees that are just as fresh to your late season customers as those your early customers purchased. Multiple deliveries can add transportation expense, but there are often other Christmas tree retailers happy to share the cost of a partial load. The type of shade structure can be very important. One type of shade – storefronts – yielded trees that were significantly dryer than other types of shade. Most storefronts fail to shade trees enough hours in a day to keep them fresh. Problems with needle shed were associated with tarps, buildings, and tents with no sides as well as storefronts. Problems with sunscald in which needles on exposed branches turn red were observed under tarps and tents with no sides as well as storefronts. Ultimately, exposure to sun and wind can degrade the freshness and quality of trees within a number of hours. Perhaps the most important tree care activity is the frequency of watering both in storage and display. Irrigation can offset other deficiencies such as lack of shade at a retail site. Regular daily watering maintained higher moisture levels and fewer problem trees than less frequent irrigation. In fact, irregular irrigation represented as many problem trees as not irrigating at all. Trees that are irrigated during storage & display stay fresher. The type and sophistication of irrigation did not seem to matter as much as the frequency of irrigation. One grocery store kept their trees watered and fresh in homemade, trash-bag-lined, cardboard box tree stands. Some retail lots have created shallow landscape timber and tarp pools in which to store their baled trees with their trunks in the water. Many retailers hand-water the mulch or sod underneath their trees. If high humidity is maintained, trees will not lose moisture content as quickly. If trees are watered through their trunks, they can actually increase their moisture content and recover lost freshness. Stand type used in display was highly significant. The pin system provided both the best and the worst moisture content averages. When used with water-filled bowls, the pin system represented the freshest trees. When used dry, the pin system represented the driest trees with the greatest number of trees in critical condition that might not re-hydrate. Again, water makes the difference. Almost every retailer surveyed provided fresh cuts to their customers’ trees. Christmas tree freshness research has repeatedly identified the importance of making that fresh cut before displaying the tree in water. Trees will take up more water more easily if that cut has been made shortly before the tree is placed in water. In conclusion, the NC State University survey identified key factors involved in retailer Christmas tree freshness. You can sell fresh trees all season if you put together a tree care package that includes multiple deliveries, adequate shade, fresh basal cuts, and irrigation of both stored and displayed trees. Take short cuts on tree care and your Christmas trees will tell on you! Needle shed and sunscald that show up on your retail lot reflect inadequacies in tree care. None of these recommended practices represent insurmountable burdens to the efficiency and cost effectiveness of your retail lot operation – we observed them in the market place on competitors’ lots. The challenge is yours.